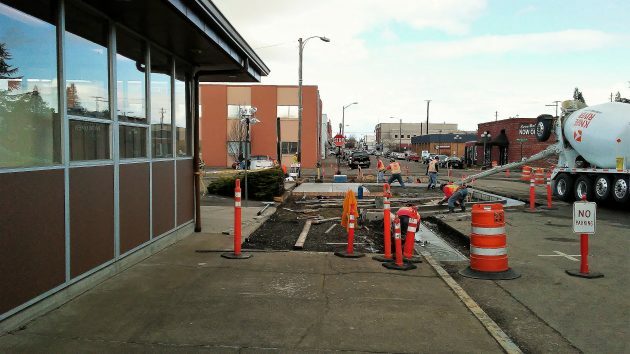 Work continued Friday on a big sidewalk extension on Second Avenue at Washington Street..
On a super-local subject, there’s been a lot of talk about parking at the Albany Post Office lately, most recently at the city council meeting Wednesday. 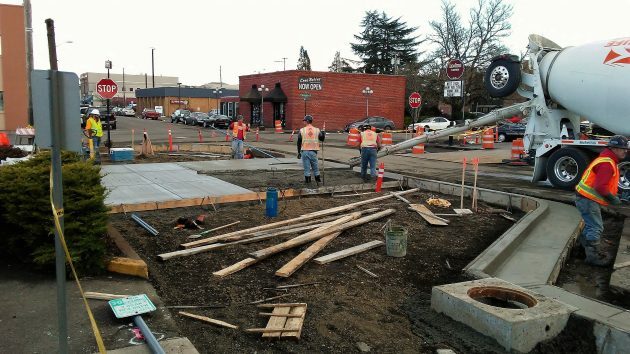 But on Friday there was no parking at all as construction blocked both the lot and adjoining streets, making mailing a letter more of a challenge than usual. On Wednesday, when the towing of unauthorized vehicles from private property was on the agenda, a couple of postal employees complained to the council that spaces in the post office lot were often taken by non-postal customers, including diners at nearby restaurants. The lot now is posted around the clock for postal business only. But apparently it hasn’t worked. Mayor Sharon Konopa thinks it’s unnecessary to restrict the post office lot to mail customers 24 hours a day. She suggested that only two or three spaces be set aside around the clock, and that after hours the rest of the lot be released for public parking. The mayor also said that because of changes in personnel, she hadn’t known whom to talk to at the post office — about parking or her idea that the office be moved. If she’ll wait a month, she can talk to the new postmaster. Her name is Pamela Moody, now the postmaster of Seminole, Texas, and she will start in Albany on March 6. The post office’s Second Avenue side on Friday. Okay, change the parking method around the post office then move the post office? Come on Madam Mayor – use your head. Hands off the post office, Sharon. The feds can screw it up sufficiently all by themselves. They don’t need your help. You are spot on. Republican led feds screwed it up in ’06 with PAEA requiring USPS to prefund benefits 75 years in advance. That’s right! Set aside $$$ for employees not even hired yet. Overreach. Now we see it on the local level in ’17. Does she REALLY believe a new Post Mistress can just move the facility on a whim? Keep at it Sharon. Rather see you spend your efforts trying to do the impossible instead of things you can actually accomplish. Ya know, the Mayor’s idea that the Post Office should open parking to all comers after hours is a little presumptive. It’s not City property. Just ’cause it’s there, doesn’t mean the City can make a rule about it. I have kept a PO Box for years due to mail theft at my home. I pay to use that property to receive my mail. Not only is this a problem now, but I’ve spoken to the Post Master several times over the years when we cannot access our paid for post box because of downtown concerts in the summer. Just what is meant by “after hours’? I am often at the PO around 7 – 8 pm and there is always a constant flow of people using the post office. This is Federal Property, we Pay to use that property but are blocked from being able to use the PO unless we want to park blocks away and walk in. Simply, that parking lot is for PO business only & not for restaurants or concert attendees. Since the moment they announced the location of the Carousel, the writing was on the wall. The parking problem will only continue to get worse. The Mayor will just “bully” the Post Office out of its location by making the conditions as poor as possible. Our City doesn’t have easily accessible public transportation, so parking is a definite requirement for getting downtown. What will they do when the new water fountain is constructed? Albany continues to fail in the planning department. New water fountain? What did I miss? There was a Facebook group created in August 2015 and a local parent was working with the City of Albany. I’m not sure of the current status since there has not been an update since last summer. The last word was that the City wanted to construct the public fountain next to the Carousel. Below is a link to the group. Albany should just close it’s doors, and we can just go to Jefferson or Tangent or Lebanon to get our mail. I mean what can be more important than having carosel down town Albany? Our own ? Our own city allows builders to build houses in a flood plane with one exit that is zoo, so pet named for the street names on down 53rd. And those homes on the other side of the river next to the golf course they did flood in 96 Why should we expect better logic from that group to consider parking via assume the post office to move. I sincerely hope the post office can not, and will not move, so all those who use the post office will get more involved and replace the logistically numb responsible for the placement of the carousel next to an already cramped parking situation.Why not put the carnival ride in the old safeway store? The parking is suffecient. The Albany Post Office had a detached carrier unit that removed the carriers from downtown and left the regular Post Office for retail. The Post OFFICE isn’t going to just up and move. Now that there is a desire for the city to acquire the land, the Post Office will make it very expensive for the city to purchase. Just look at Portland the Main Post Office and processing facility. City is purchasing it after years of trying to acquire the land and is paying a fortune. Fact of the matter is the property is considered federal and the mayor has no controll over anything that happens with it. If I was the Postmaster and cars were parked illegally or illegally imaging the delivery of mail I’d tow and fine the owner or city. That my friends is allowable under federal law.